Ahead of the World Swimming Championships in Shanghai, Australia's Emily Seebohm reflects on a difficult past few months in which the Olympic gold medallist has endured numerous bouts of sickness. "I guess it hasn't been one of my better preparations because I've been so ill lately. It started with swine flu in February and then I had two bouts of tonsillitis and then I had bronchitis," she says. Emily's collapse at the Australian Swimming Championships in April caused a minor media storm in a country that dominates the pool and where the 19-year-old is part of an ever-expanding squad of swimming stars. The meeting in Sydney served as trials for the World Championships that start in Shanghai on 16 July and after collapsing by the side of the pool, Emily withdrew from the rest of the competition. As a result, the multi-disciplinarian will only compete for certain in two events in China - the 50m and 100m backstroke. And it doesn't end there. Her latest trip to hospital followed victory in the 100m backstroke at the Santa Clara International Invitational in California. "I got sick while I was in America with what they thought was food poisoning. It turned out my pancreas was swollen so I spent two days in hospital on a drip without any food," she adds. "I'm not a big fan of not doing anything for a few days. I've got so much energy that swimming helps me get to sleep at night so being in hospital wasn't the greatest couple of days." 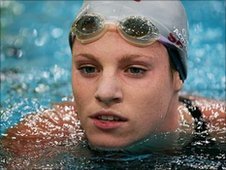 At last year's Commonwealth Games in Delhi, Emily swam in eight events, securing eight medals, three of which were gold. 2011 was supposed to be the year in which she could build on her successes and plan for the London Olympics but, so far, her season has been plagued by excursions to the hospital. Despite the continued setbacks, the Olympic gold medallist does not believe her season is a write-off. "Apart from getting sick I'm still doing ok and still have all my fitness there so I haven't lost any of that which is good," she states. "Once I got out I found more motivation, I just wanted to swim faster and faster every time I had time out, so it worked out good I think." Coming into the World Championships, Emily appears relaxed, saying she does not feel the pressure to prove anything, let alone win: "I just want to get out there and get more experience, see where I am in order to see how I do for next year". Her collapse at the trials in Sydney also, by chance, throws up the chance to participate in an interesting experiment. Having failed to qualify for more than two events at the World Championships, Emily can test her approach for the London Olympics - will she attempt as many as eight events and risk burn-out or will she find success in a chosen few disciplines? "It all depends on how this meet goes and how I handle myself with all the events. I'm only doing two individual [races] and maybe a couple of relays - it's so much less than the eight I did at the Commonwealths so we'll see which one works out better." Away from the pool, Emily was caught up in the worst flooding to hit Queensland for a generation. In January, great swathes of the Australian state was submerged beneath flood waters, killing dozens and causing billions of dollars-worth of damage. "Many lives have been lost and still many people have not been located. It was a very sad time for all of us in Queensland and Australia. It will take a long time to recover from such an awful natural disaster," Emily says. "At our club we decided to raise money for the flood victims and so held a swimathon where we swam for 12 hours non-stop in teams and every member tried to collect donations, and our club raised just over A$18,000." The World Championships in Shanghai will be the last major swimming competition ahead of the 2012 Olympics in London and it is clear to Emily what the real goal is. "It's all about London and it's not that far away now," she says. "It was three years away and now by the time you blink your eyes it'll be there." Come 2012, Emily's prodigious talent means she has a real chance to place herself among the pantheon of great swimmers. Nevertheless, she is at heart like any other 19-year-old. She says: "I'm really excited because apart from the royal wedding that was there it seems a really great place with so much to see and do there - there's so much shopping to be done!"